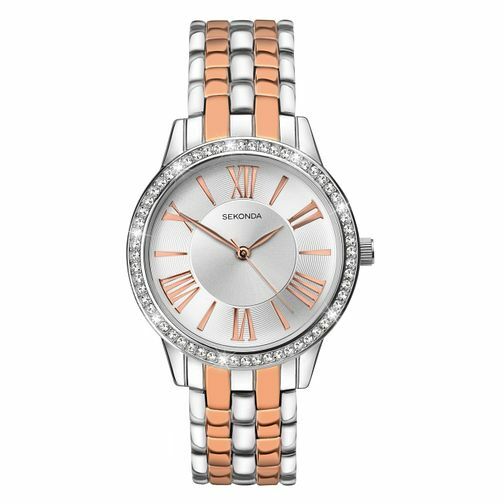 This elegant ladies' Sekonda watch will shine for any occasion with its two tone bracelet and stone set bezel. The textured silver dial is simply sleek in its styling and design, and is perfectly complimented by the rose gold time hands and Roman numeral hour markers. The distinctive two tone silver and rose gold stainless steel bracelet is sure to stand out from the crowd. This timepiece is lightweight, making it ideal to wear everyday, yet has enough sparkle to suit those more glamorous occasions.